Precipitation may be higher than normal over South Dakota. Weather Services International, a private weather information firm, is forecasting above normal temperatures in the Northern Plains and northern Rockies in September, October and November. "While the oppressive summer heat has at least temporarily broken across much of the northern U.S., we do expect a return to more persistent above-normal temperatures as we head into the fall season," says WSI Chief Meteorologist Todd Crawford. "The fall pattern will generally be driven by the very strong northern Pacific Ocean signal, with significant positive ocean temperature anomalies surrounded by negative ocean temperature anomalies," he says. Climate Prediction Center's precipitation outlook September-November. "This particular setup, known as the negative phase of the Pacific Decadal Oscillation, typically changes the downstream atmospheric pattern to favor very warm temperatures across the north-central and northeastern U.S. for much of the fall season. As we near the end of fall, however, we feel that there are increasing chances for below-normal temperatures across the central and eastern US, as atmospheric blocking re-emerges." 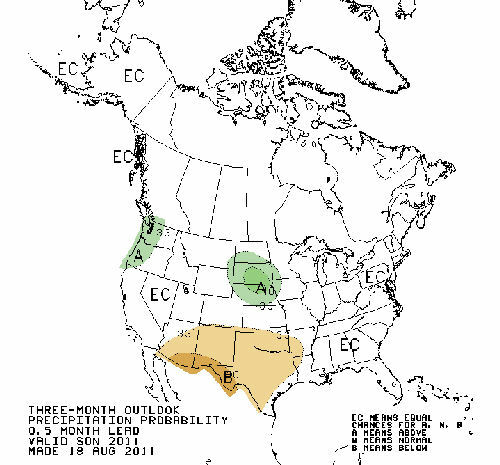 The National Weather Service Climate Prediction Center's three month outlook for the Northern Plains is similar. It shows better than average chances for above normal temperatures for the region. Its outlook for precipitation for the same period shows better than average chances for above normal precipitation in South Dakota and equal chances of normal precipitation in North Dakota. WSI provides weather information for the energy, aviation, and media markets, and multiple federal and state government agencies. WSI is a member of The Weather Channel Companies and is headquartered in Andover, Mass., with offices in Birmingham, England. The Weather Channel Companies are owned by a consortium made up of NBC Universal and the private equity firms The Blackstone Group and Bain Capital. More information about WSI can be found at www.wsi.com.